Bhagwan Sethi was witness to the devastating Super Cyclone, which ripped through large parts of Odisha in 1999. Fourteen years later, he saw ferocity of Phailin that landed close to Gopalpur. ASKA: Bhagwan Sethi was witness to the devastating Super Cyclone, which ripped through large parts of Odisha in 1999. Fourteen years later, he saw ferocity of Phailin that landed close to Gopalpur. He thought he had seen it all. Then Friday happened. It was a Friday he would not forget. As tropical cyclone Titli crossed close to Palasa in Andhra Pradesh and tracked northwestwards pelting rains in its course, Sethi’s hometown Aska turned into a mass of water. Located between two rivers, the town saw frothing Rushikulya and Bada Nadi entering into Aska from both sides and engulfing the habitations. Not just the civic body, 100 nearby villages were inundated as incessant rain lashed the region on Thursday night and Friday. The water level continued to rise. 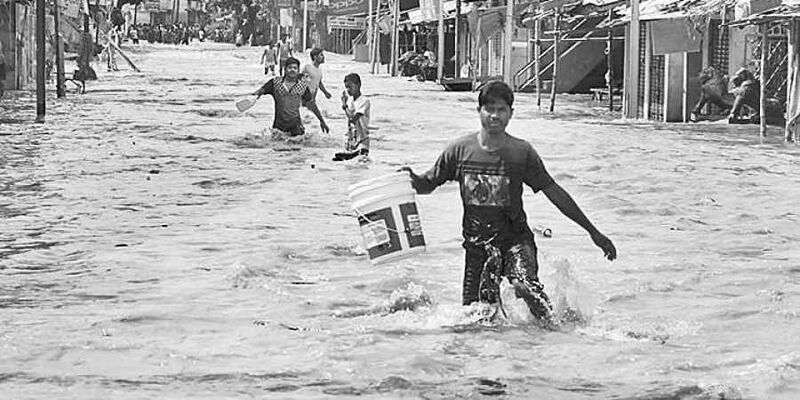 First the roads were submerged and as rains showed no signs of relenting, the water level rose menacingly flooding houses, government establishments and commercial premises. At some places, the water level touched 10 feet. Panicked, residents moved to higher grounds. Some went to the first floor of their buildings, others were perched on rooftop. It was a mini Kerala in Aska as thousands of people remained trapped in their homes which were overflowing with storm water. “I had never seen such flood in Aska town before. Not even during 1999 Super Cyclone,” said Sethi, a resident of Sonama Sahi in the town where water level reached 10 feet height on Friday. “Though Aska had suffered extensive damage during 1999 and Phailin, damage caused by a severe flood is something which had not happened in the past two and a half decades. The last such flood had occurred in 1990,” he recounts. Intensity of the storm-induced flood could be sensed from the fact that even 40 hours later, water was flowing at three feet height damaging properties worth crores on Saturday afternoon. Thirty-year-old Jamuna Nayak’s thatched house in Gondapalli was completely damaged in the deluge. “As flood water inundated our house, we went to the nearest school to take shelter. When I returned with my husband and children, my house was completely damaged,” said the woman who lives in Ward No.9 of Aska town. The family is clueless about its future. Kutcha houses of around 20 families in Gondapalli were damaged by the flood. While Titli damaged electric poles and thatched houses, the subsequent flood inundated offices and buildings responsible for emergency services including Aska Community Health Centre and Aska electricity division. Boundary wall of Harihar High School also collapsed due to cyclone and flood. Roads and culverts were damaged. Pitabas Parida, a resident from Taluka road said, electricity was yet to be restored while drinking water supply was badly affected since pipelines had been damaged by the flood. With vegetables and other food materials not available, people were looking for relief. Jamuna’s husband Jagannath Nayak said relief distributed by the administration was yet to reach them. People from nearby villages of the town also complained of the same. On Saturday, the State Government airdropped relief materials in Aska town and nearby affected villages. The Government took help of Indian Navy and deployed three NDRF teams and four ODRAF teams in Aska to carry out relief and rescue work, said Chhatrapur SP BK Roy, while taking stock of the situation at the spot. The situation in the area is improving gradually, he said, adding, electricity is expected to be restored by Sunday.